South Korean MMO kingpin Nexon is looking to acquire studios, and one newspaper claims that it's looking to start with the big dogs. If you're a publisher with a lot of cash at hand, you start looking into gathering more studios underneath your giant, money-laden umbrella. 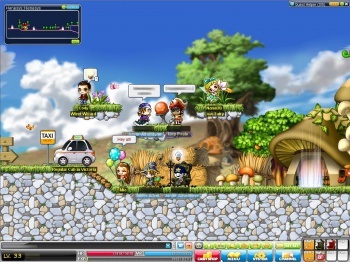 That's the case with Nexon, the Korean MMO publisher best known in the west for MapleStory, as it told Bloomberg that it was interested in acquiring Japanese mobile-game developers with its significant cash reserves. However, a South Korean newspaper claims that Nexon has also contacted EA - yes, that EA - regarding a potential takeover bid. While this report does seem completely unsubstantiated, it had enough weight behind it to cause an increase of almost 6% in EA's stock prices. It's unlikely that Nexon would be able to simply purchase the North American publishing giant in full. Even after a stellar IPO in Japan last year, Nexon only has about $1.5 billion in the bank. While you and I would probably love to "only" have $1.5 billion in cash, it's far below EA's market cap of ~$5.3 billion, meaning the best that Nexon could do would be a partial acquisition now with intent to finish the deal in the future. Given the circumstances, this acquisition - if real - seems unlikely to move forward. If it did, however, it would give the Asian MMO powerhouse a partial claim to such noteworthy Western game series as Battlefield, Mass Effect, and Madden NFL. Nor does it mean that anything would necessarily change if it did - French conglomerate Vivendi acquired Activision in 2007 as part of the Activision-Blizzard merger, and the Call of Duty characters have yet to don so much as a single beret.